This year’s Chapter Awards for Innovation and Exemplary Practice in Earthquake Risk Reduction go to Dr. Jack Boatwright and the EERI Public Policy and Advocacy Committee. 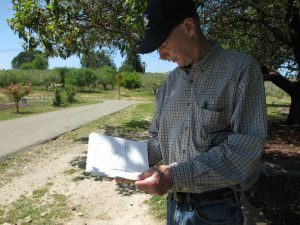 Jack in the field in 2012 at the Gilliam Cemetery near Sebastopol, consulting his notes on the impacts of the 1906 earthquake on the headstones in the cemetery. Dr. John (Jack) Boatwright tirelessly served to improve seismic safety in the San Francisco Bay Area and beyond. Throughout his career at the USGS in Menlo Park, Jack worked hard to bridge the gap from scientific discovery to risk reduction, forming productive partnerships with scientists, engineers and public officials at the local, regional and national levels who work to improve public safety and societal resilience. He was Northern California Coordinator for the USGS Earthquake Hazards Program. He ran the annual two-day Northern California earthquake workshop that shared the latest scientific understanding with community leaders, and dedicated the second day to practitioner-oriented topics. As Chief of the Earthquake Effects Project, he supported SPUR and ABAG in their efforts to translate scientific information and apply it to make San Francisco and the Bay Area more resilient. Scientifically, Dr. Boatwright contributed understanding of shaking during largeearthquakes in the Bay Area. He extensively analyzed shaking intensity from the 1868 M6.8 earthquake on the Hayward Fault and the 1906 M7.9 earthquake on the San Andreas Fault. In 1989, Jack published the first map of shaking amplification for the City of San Francisco. He is known for recapturing the past events by investigating percentages of toppled tombstones in cemeteries in Alameda, Contra Costa, Marin, Mendocino, Sonoma and Santa Cruz Counties. As a resident of the city and county of San Francisco, his service went beyond his job toaid the city to develop policies to reduce seismic risk. He was concerned about northern California buildings and infrastructure. He was an active member of the City and County of San Francisco’s Community Action Plan for Seismic Safety committee that led to a groundbreaking 30-year Earthquake Safety Improvement Plan for San Francisco. After the Napa earthquake he maintained that we can’t stop the shaking, but we can build better. Upon his passing, he will be missed for his support of the USGS HayWired scenario. As a member of the review panel, he brought his scientific and earthquake experience to bear, and he challenged new analyses of societal impacts because he cared. His presence will be missed whenever earthquake matters are being discussed in the Bay Area, and always as a treasured colleague and friend. We specifically want to acknowledge his peers, Stephen Hickman and Andrew Michael, who contributed to our appreciation and this description of Jack’s accomplishments. One of the special missions and functions of EERI—something that distinguishes it from many other professional organizations—is the goal of bringing experts of different fields together to bridge the science-policy divide. That is no easy thing to do. Taking up that challenge, the EERI Public Policy and Advocacy Committee (PPAC) is at the core of EERI’s advocacy strategy. relevant findings from their own professional vantage points that may be important to bring to the attention of civic leaders and the public. A majority—though importantly not all—are California-based. The agenda is dynamic, as is the group’s membership over time. Notably, the past four years have marked a renaissance of effort and achievement for the PPAC. In the opinion of the Northern California Chapter Board, the group’s efforts have surged and solidified, resulting in an impressive list of accomplishments and enhancements that deserve special recognition. A pivotal moment was the convening of the EERI Policy & Advocacy Workshop in December 2015. Committee Chair Laura Samant and others wrote and were awarded an EERI Special Projects Grant to bring the committee together from across the country to Oakland for a day-long summit. Committee members wrote and debated nearly twenty potential policy positions, to address the following: What are the most important policy issues that need to be tackled to increase earthquake resilience? What should the position of EERI be on these issues and why? The legacy of the workshop is a formal process through which the committee elevates policy topics of importance and makes recommendations to the EERI Board about the stance it should take and why. Each position statement is accompanied by a white paper that summarizes the evidence base behind the ideas; both documents are vetted in a multi-step, rigorous review and voting process. To date, PPAC members have produced six consensus policy position statements that the EERI Board has adopted. These address vital topics such as promoting confined masonry construction internationally, the need to eliminate URMs and nonstructural hazards in schools, and the importance of reliable lifeline structure systems, creating earthquake resilient communities, and reinvigorating the National Earthquake Hazards Reduction Program. More position statements, about Earthquake Early Warning, housing, and other topics are forthcoming. The process of evaluating position statements has become an anchor for the group’s progress. In the past two years, Co-Chairs Zahraa Saiyed and Chris Poland have sustained and even grown this momentum, and continued to lead the PPAC towards deeper and more impactful direct relationships with legislators. One notable example is the extensive back and forth effort with Senator Feinstein’s office to craft specific language for a NEHRP renewal authorization bill. Another is the convening of a weekly California legislative task group that engaged with state Assembly Member Adrin Nazarian to support several major pieces of earthquake legislation in 2018 (AB 2927, 2681, and 1857). These efforts not only forged important relationships and made an impact on the policy trajectory, but also raised EERI member capacity to be of assistance and the prominence of the organization. We also recognize the foundational work and increasing importance of EERI staff support, from Beki McKelvin and Zoe Yin in 2017 and 2018, that contributes to the PPAC’s accomplishments.